Things have been relatively calm in our corner of the blogosphere for several months, so I thought I’d add a post about a treatment I’ve been working on in the Paper Lab. We received five leaves of correspondence from the US History manuscript collection at Lilly Library. 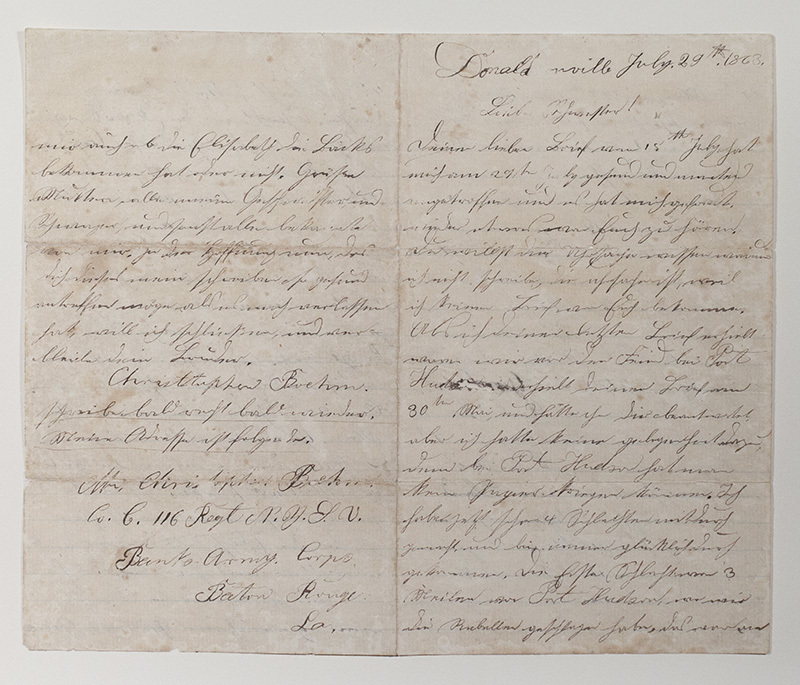 The small collection of letters are written in German by Philip Boehm, a Union soldier, to his sister during the Civil War. All have been laminated in a manner that was new to me: it appears a well-meaning, but ultimately misguided person placed each leaf in a plastic3-ring binder pocket protector and then used a domestic iron to melt and seal it all together. The film is perhaps polypropylene or polyvinyl chloride (I didn’t do the testing to confirm). Most laminations involve a commercial product: either a heat-set or pressure-sensitive adhesive backed film is applied to both sides of a document. Over time, the films can oxidize, turn yellow, and possibly go brittle. 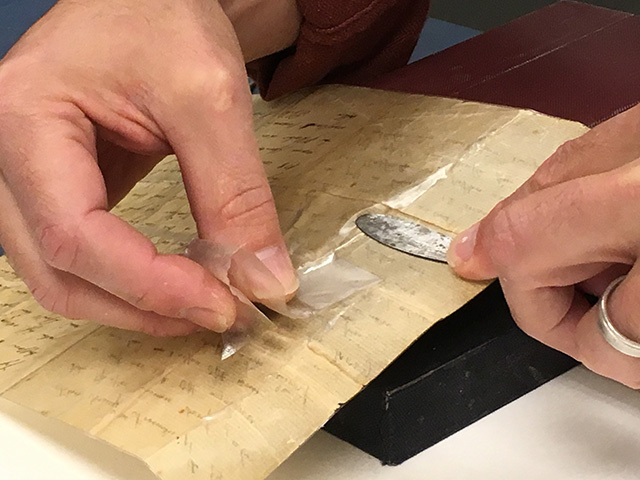 The enclosed paper document becomes exposed to this oxidation and hydrolysis and can also become impregnated with the melted plastic or adhesive from the film. Removal generally follows methods associated with pressure sensitive tape removal- the use of solvents to swell or dissolve the film and/or the adhesive deposit. Heat can also be applied in a variety of ways to effect removal. In this case, a combination of the two approaches is proving effective. Rather than applying heat from above, with a stream of hot air or getting in-between the materials with a heated spatula, I found that heat from below was the most effective. 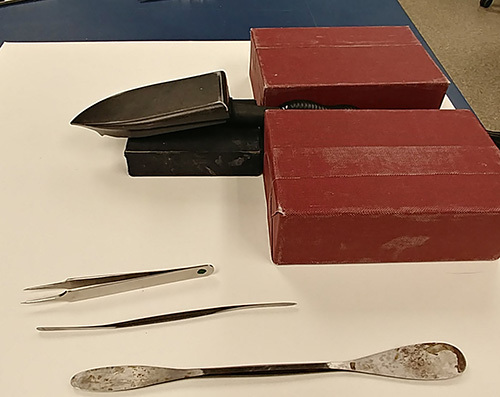 A conventional tacking iron that every conservation lab possesses is set to the lowest heat setting and stabilized in a face up position. Using the surface as a mini hotplate, the document is stabilized on the iron with a Casselli spatula in my left hand while I slowly pull the softened film away with the other. In this manner, strips are removed from recto and verso sides. The process takes around 45 minutes. After film removal, the paper still appears translucent and darkened due to plastic that saturated the fibers. Testing of solvents reveals that an immersion in acetone for about 15 minutes reduces this effect by swelling remaining laminate substances and leaves the paper in a close to original state. Mending tears with tissue and wheat starch paste follows. Humidification and pressing completed the work.